Three Illinois statute books have been added to my Illinois virtual law library. The three-volume set is important to those researching Illinois laws from the mid-1800s. The first two volumes consolidate laws by topic. They cover laws in place from the 1845 Revised Statutes to 1865. How are they useful? If you need to research Illinois statutory law between 1845 and 1865 by topic, this is the set to check. The third volume has session law books from 1859 through 1865, with volume indexes. A consolidated index covers all session laws passed between 1858 through 1865. Prior to this addition to the virtual law library, there was a gap in listed compilations between the 1858 Scates’ Compilation [1845—1858] and Gross’ Compilation in 1868 [1845—1868]. Following the book list below, I will give a brief example of using the set to locate a law. Let’s say you wanted to look for the law in place in this time frame that dealt with divorce causes. We will check Volume I to see what it covers. To follow along, open the virtual law library, check the grid for 1865, and find Volume I of The Statutes of Illinois, Embracing All of the General Laws of the State, Complete to 1865, With Marginal Notes, Showing the Contents of Each Section, and a Reference to the Decisions of the Supreme Court Upon the Construction of Each Statute. Open the book. Part I contains organic laws. They precede the laws created by the state. It includes laws from places that controlled that area that later became Illinois, such as Virginia, and Indiana and Illinois territories. Part III is an appendix. Part II of the volume has the statutes, and that is the section that we need. Samuel H. Treat, Walter B. Scates and Robert S. Blackwell, comp., The Statutes of Illinois, Embracing All of the General Laws of the State, Complete to 1865, With Marginal Notes, Showing the Contents of Each Section, and a Reference to the Decisions of the Supreme Court Upon the Construction of Each Statute, Volume I (Chicago, Illinois: E. B. Myers & Chandler, 1866); digital image, Google Books (http://books.google.com : accessed 24 November 2014). The book takes you to the pages covering divorce and divorce causes. Samuel H. Treat, Walter B. Scates and Robert S. Blackwell, comp., The Statutes of Illinois, Embracing All of the General Laws of the State, Complete to 1865, With Marginal Notes, Showing the Contents of Each Section, and a Reference to the Decisions of the Supreme Court Upon the Construction of Each Statute, Volume I (Chicago, Illinois: E. B. Myers & Chandler, 1866), 150; digital image, Google Books (http://books.google.com : accessed 24 November 2014). The allowed causes are listed, and the notation in square brackets at the top indicates where the law was found in the 1845 Revised Statutes. 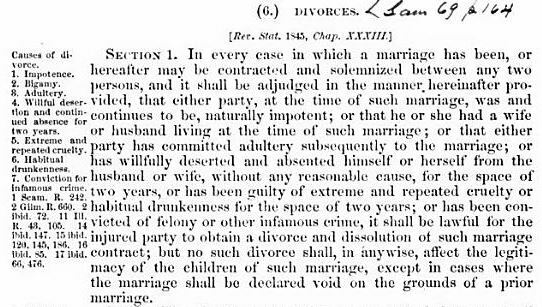 The notes along the side summarize the causes and list other publications containing relevant portions of the divorce statute. Check them out in the virtual law library to see if they add to your research. Historic research in statutory law is made easier with compilations like these. Use them to locate laws by topic, making sure to check the appropriate time frame and location for your research question. © 2014, Debbie Mieszala. All rights reserved. This entry was posted in Illinois, Law and tagged Illinois Laws, Virtual Law Library. Bookmark the permalink.